BACKTOFRANKBLACK.COM: CHRIS CARTER interviewed by BacktoFrankBlack! 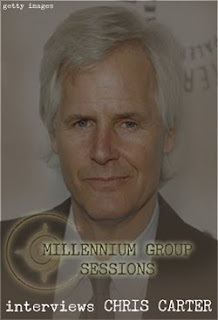 In this episode of the Millennium Group Sessions series, Troy and Jim speak to Chris Carter, creator, writer and all round wonderful head honcho of all things Millennium and X-Files! 15 Responses to "CHRIS CARTER interviewed by BacktoFrankBlack!" Wow, I didn't expect this one so soon. I thought the Megan Gallagher one was next. This was a very enjoyable listen, always fun to hear new things about Millennium from the main man himself. While the fun factor of past podcasts was pretty much absent due to the seriousness of this podcast (after all, Chris Carter is a serious man, no disrespect Chris), it was a great coup for the campaign. Thanks, Chris Carter, thanks Troy, thanks James. And I really should check out the Harsh Realm DVD boxset in the near future. congrats to BTFB for your awesome achievements during the 1st year! OMG you are so living the ultimate fan dream! When I was 17 or 18 years old, I think I literally would have died if I got to talk to Chris Carter. I'm a bit older and calmer now, but still in awe of the man's vision and talent. Thanks so much for everything you're doing to get the word out about the show and potential film! I'm a fan from way back (I used to be on TIWWA as LauraKrycek, but got really busy during college and never really had a chance to go back to it after graduation), and would love to see more of Frank and Jordan. Congratulations and thank you for bringing us a great interview the main man himself, Chris Carter! A very serious man and 100 percent always the professional. It was wonderful to hear his thoughts on the various aspects of Millennium. My life changed immeasurably thanks to his inventiveness and creative genius. When I consider the enjoyment I've had, the skills I've learnt and the friends I've met through running the tribute websites and message board over the years, its all thanks to Chris and his team. I honestly can't thank him enough. Thanks for taking the time out to chat for us and thanks to B2FB for bringing us the ultimate Millennium podcast guest. Thanks for your kind words Laura - and Steve. Fan boy dream? Well, I can't pretend I considered I'd have chatted to all these people this time last year. Has been a fascinating run of conversation! And yes Josef, I need to invest in Harsh Realm (and shock horror - Bone Dry). Megan next week. You'll love her. Be hard not to! Troy and James, Thank you for your great questions. Those always give a nice foundation for the questions to come. James, I really liked your question comparing the set up of X-Files to Millennium (family unit). Also I didnt know that it was FOX who approached Chris to make another show! And also the question about "The two evils" (facts/myth)! Those questions go right into the essential stuff of the show. And they make it so much more interesting than 'usual' press interviews!! One cant fail to notice how much thought you payed to this TVshow and its themes. And since I am a fairly new fan, the podcast are like 'lessons' in that way. I also liked Chris's look back onto IWTB. It was also interesting how he answered James's question about how he felt about the fact that the fans of the show are still 'around'. Listening to the podcast I get the feeling though that Chris may be a bit to harsh to himself? Maybe its just because he always wants things to be top notch and so he thinking back to Millennium and how it was made parallel to X-Files he...Just that he spoke more about what could have been better than what was good about the show. Maybe thats just his 'job' and also his character which made so many 1013 things so good: always giving it your best. As Josef said above "seriousness" :). Plus you know... I noticed how Chris uses the words "sweet" and "funny" quite a lot. I would interpret his response "Its funny" that he liked the original question :). Because even though Chris can be serious, he appreciates witty humor a LOT? (see his writing in XF and also some novels & movies that he recommended in the past). But yeah, work is just a rather serious issue I guess. Thanks for this totally unexpected (for me) interview! It's always a pleasure to hear something from Chris. Let's keep our fingers crossed for a Millennium movie! I must be loosing my mind. I was sure I posted yesterday. Must have nodded off and imagined it. This is a great interview. Good job guys. I completely understand why you would be humbled by the mere presence of Mr. Chris Carter even on the telephone. I couldn't tell you were nervous. He is an incredible man with a wonderful imagination. I really enjoyed this interview. Listened to it twice now. Really a great job! Thanks alot for this podcast, James, Troy and Chris Carter. It's always fantastic to learn about his thoughts and his approach concerning his work. When I listen to him I realize how much I have become used to a certain business jargon of people in the media which he seems to refuse completely and which seems very real to me. I really like him very much and I'm interested in everything he will give us in the future. As people have said, what was so enjoyable was to have such an honest "Adam" - that he laid it straight. He didn't agree Millennium was ahead of its time, he said so - he explained why. There is no fan pandering with Mr Carter and that makes him more endearing to the fans! Just on a sidenote, Mr Henriksen has also listened to the podcast and he enjoyed listening to Chris very much. Just to let you know he shares your appreciation for Chris' time! Well, I finally found the time to listen to this milestone. Congratulations, Troy and Jim, and THANK YOU so much for this essential interview, which was something I had been hoping for for a long time. I can only echo Graham's words: Chris Carter is probably one of the persons who have influenced my life more than anyone. I admire him and am infinitely grateful for everything he has done. His influence has only been positive and it makes me even more glad to see that he is a great person, besides a great artist. One life-changing moment was when I heard Chris talk about Season 2. I thought he was not completely happy with it, but when you asked him about any shows he was proud of and he mentioned Morgan and Wong's episodes, I was gleaming with joy. I am always surprised by the fact that neither Chris nor Frank seem to realize how special Millennium is. I hold The X-Files very dear to my heart, in fact by this time it's probably part of my DNA, but from the first second of Millennium I realized that it was the superior show. And as much as I LOVE The X-Files (I cannot stress this enough), I am convinced what Millennium did cannot be surpassed by anything else. And I think it has to do with what Chris said about the difference between DD/GA and Lance's approach to their roles, which is also the difference between the shows: Lance (and Millennium) work from the GUT (rather than the mind). There's a focus, a center of gravity, an unshakable quality in Millennium. So rather than ahead of it's time, (and I've said this before), I'd say it's eternal. Oh, and Chris can indeed seem very serious but he's got a goofy sense of humor I really enjoy. He was quite funny during many IWTB interviews. Looking forward to the interview with Megan! Diego, I thought Chris said "Darin Morgan season 2 episodes". It was really hard to hear that response, I played that part a few times and I still wasn't sure what he said, if it was "Darin Morgan" or in fact like you said "Morgan and Wong". You're right Josef he did single out the two Darin Morgan written episodes. How could you blame him? Although Chris didn't seem to be too sure about any follow up to the series I don't think it's anything to be worried about. As was mentioned in the interview the 1013 crew tried really hard to keep X-Files 2 under wraps. He did say that next time he would invite more scrutiny to help with publicity. But it seems he keeps details close to his vest unless there is something official to pass along. Thanks again Troy and James. And thank you Mr. Carter. Your work has always entertained and inspired me. Here's looking forward to more 1013 magic in the future! Great interview. I always love listening to Chris Carter talk about his craft. Yes he's serious, yes he's reserved, but that gravitas always comes across as so considered and measured in terms of what he says and it's always something intelligent and insightful. I'd love to see where he would take Frank and the Millennium universe next, and even moreso in the aftermath of the new angle and depth that The X-Files: I Want to Believe achieved, great movie (peppered with Millennium alumni) that it was. I'm playing catch-up with the podcasts and really enjoying them all; I'll be sure to share my thoughts on some of the others right here on the blog. I had a few problems accessing this one, though: it didn't appear when I subscribed to the podcast and so I ended up streaming it directly from the site. Anyway, they provide some great insight via the intreviews and it's great to see so many people eager to see a Millennium movie happen. Myself and cohort Dixon met Carter & Spotnitz at Forbidden Planet in London last summer as part of the IWTB promotional rounds, and we were certain to note our support for Millennium then, which Carter in particular really seemed to appreciate.